Lynnville-Sully students, staff, and community members will shout their Hawk pride loud and proud during homecoming week, Sept. 25-29. A variety of activities have been planned by the high school student council to promote L-S pride along the “Passport to Victory” 2017 homecoming theme. Members of the 2017 L-S Homecoming Court are, front row, left to right: Camryn Russell, McKinley Conover, Skyler Young, Jataya Meyer, Hailey Scandridge, and Christine Nikkel; back: Cody Gibbs, Elijah Collins, Jesse Van Wyk, Drake Ehresman, Carson Dunsbergen, and Brevin Hansen. 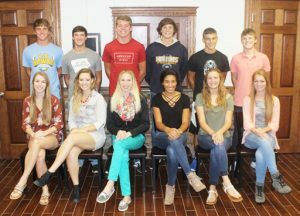 Homecoming royalty will be crowned at Coronation on Thursday, Sept. 28, at 7 p.m. in the high school gym. At the high school level, freshmen, sophomores, juniors, and seniors will go up against one another in friendly competitions throughout the week. Points will be awarded in the following categories: Dodgeball, float, windows, skit/lip sync, sidewalk art, and dress-up days. Middle school students will also participate in their own dress-up days, and elementary students will catch the homecoming spirit as well. All K-12 students are encouraged to wear school colors as they participate in Friday’s parade which winds around Sully’s town square, starting at approximately 2:30 p.m. A short pep rally will follow the parade at the new stage in Sully Central Park. Various activities open to the public include powderpuff volleyball in the high school gym on Tuesday, Sept. 26, starting at 7 p.m. A powderpuff football game will be held on Wednesday night, Sept. 27, on the field following a youth group meeting which starts at 6:30 p.m. On Thursday, Sept. 28, the homecoming king and queen will be named during coronation. The event, which also features a pep rally and skits/lip syncs from each high school class and the senior parents, starts at 7 p.m. in the high school gym. Friday night, the Lynnville-Sully Community Education Foundation will host a chili supper from 5-7 p.m. in the middle school gym. For a freewill donation, the community is invited to enjoy chili, chili/hot dogs, carrots, chips, and cinnamon rolls. All alumni who attend will be entered into a drawing for a $100 gift card! The Hawks will take on the Pekin Panthers for the homecoming football game starting at 7 p.m.
High school dress-up theme: ‘Murica (patriotic); middle school dress-up theme: America day. High school dress-up theme: Decade day (sr.-90s, jr.-80s, so.-70s, fr.-60s); middle school dress-up theme: Sports team day. Powder puff volleyball, 7 p.m., high school gym. High school dress-up theme: Class colors (sr.-black, jr.-white, so.-blue, fr.-gold); middle school dress-up theme: Elder day. Dodgeball tournament during school hours. Powder puff football following 6:30 p.m. youth group, football field. High school dress-up theme: Destination day (sr.-Texas, jr.-Hawaii, so.-wilderness, fr.-Alaska); middle school dress-up theme: Pajama day. Coronation, 7 p.m., high school gym. School-wide dress-up theme: Hawk pride. Parade at 2:30 p.m., winds around Sully Central Park. Pep rally to follow near new stage. LSCEF Chili Supper, 5-7 p.m., middle school gym. Hawks versus Pekin, 7 p.m.